Established in 1960, East Lawn Memory Gardens in Okemos, Michigan is located just north of I-96, a mile from the campus of Michigan State University. The flat grounds feature many mature trees and wildlife. There is a special service every September to inter that year’s cremains from those who have donated their bodies for the betterment of medical science through the Michigan State University Body Donor program. 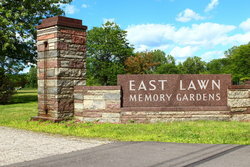 East Lawn Memory Gardens offers traditional in-ground burial, lawn crypt burial, mausoleum crypts, glass front niches in the chapel, traditional niches in the mausoleum and the MSU Medical Science Memorial Columbarium, ground cremation burials, and cremation benches.